This is a beautiful plate. I am a chef and I bought it to use in photos of various meals I have prepared. You can't go wrong with a Lenox product. A thatched bamboo motif encircles the border of this exotic British Colonial Bamboo dinner plate by Lenox just inside its gold rim. Tiny accents of blue peek through the design, like glimpses of a tropical sky. The plate can be mixed and matched with other British Colonial pieces. 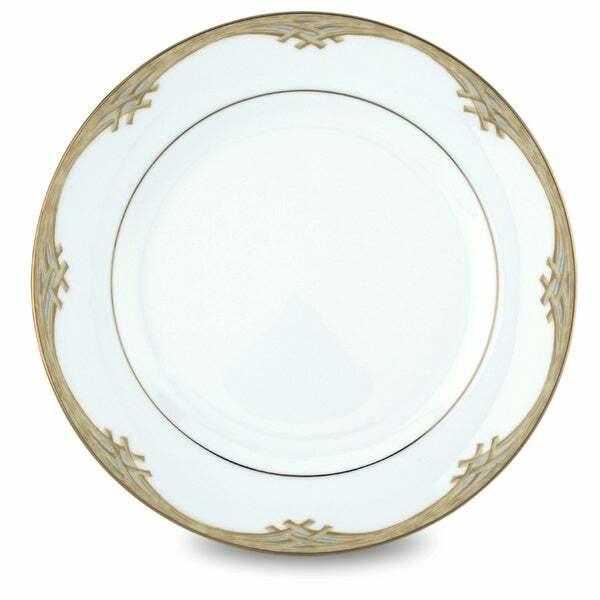 Crafted of white-bodied fine bone china accented with 24 karat gold. good product but two of them came damaged. I don't blame quality of the product. May be they didn't pack nicely, two of them came damaged. I am hopping to get my replacement soon. My mother's fine china pattern, India Tree, is more ornate than I like. I can use the special pieces with this simpler dinner plate. The British Colonial Bamboo pattern is still open for purchase if I decide to add pieces. India Tree is very difficult to find since it is no longer being produced. So it is a pleasant combination of factors at a reasonable price.